How may I be added as a TA to my course? 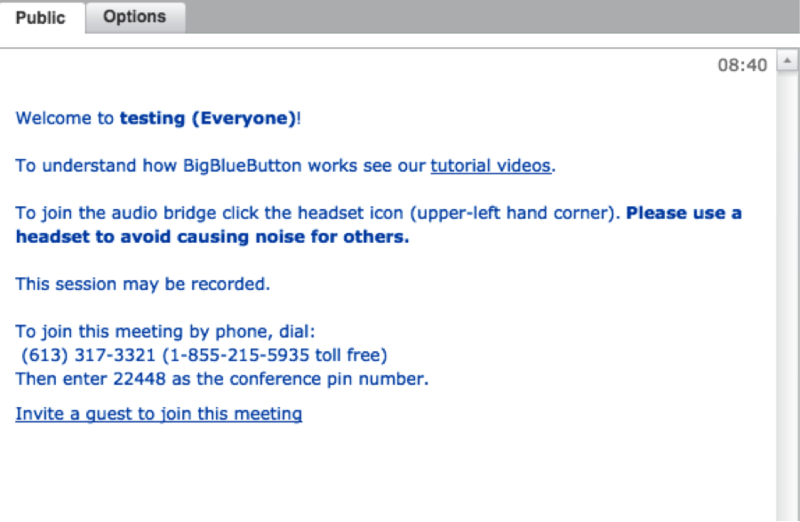 BigBlueButton (BBB) is a synchronous web conferencing tool that allows instructors and TAs to host live online presentations, seminars, office hours, or other meetings from cuLearn. BigBlueButton is easy to use and fully supported at Carleton University. It is simple to set up a session, load a presentation, answer questions, and record the session. When you add a BBB session to your course page, you are adding a virtual web conferencing space where the course community can meet. The BBB session can be recorded or unrecorded based your needs. Click Turn editing on. This button is located in the top right corner of your course page. 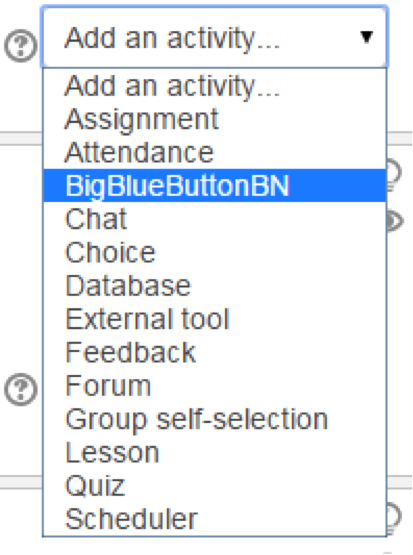 Select BigBlueButtonBN from the Add an activity drop down menu. See the screen shot below for a visual of the Add an activity menu window. Choose the preferred settings associated with this room. Some key settings include setting the moderator, scheduling the session dates, and making the session visible. The screen shot below shows a portion of the BBB settings window where participant roles can be selected and assigned. Click Save and return to course. 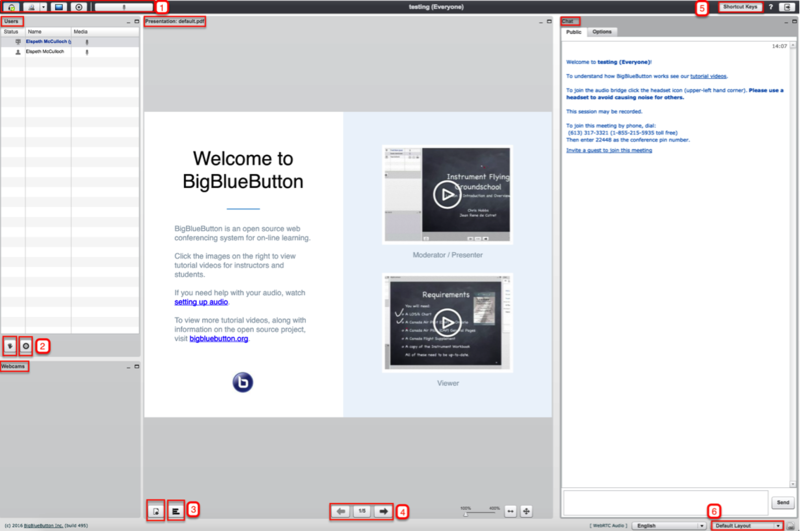 You should now have a virtual BigBlueButtonBN room setup in your course. Once a BBB session is set up in your course, you can launch it by clicking the name of the BBB session you set up. When you launch the BBB session, you will be asked to configure your audio and microphone settings for the session. Test your audio by speaking a few words and listening for the sound of your voice in your headset. See the screen shot below for a visual of the audio test window. Click Yes if the audio test has been successful (i.e. you were able to hear yourself speak through the headset speakers). See the screen image below for a visual of the Audio Test window. If your audio test was not successful, check that you have selected the appropriate microphone, and check that your microphone is plugged in correctly. 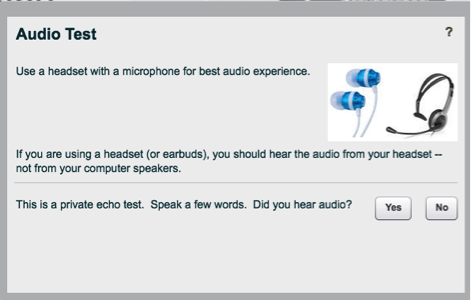 NOTE: You want to make sure that your students perform an audio test as well. Testing the microphone and audio ensures that you and your students have working equipment that allows participation in the BBB session. Watch the video for more information about setting up audio. TIP: It is preferable for students to join the session with headphones/microphones as this allows students to participate fully in the session; however, users can phone-in to access audio portion of the BBB session if they are unable to connect online. BBB will display a phone number for dial-in access to the session. See the screen shot below for the message you will see regarding dial-in phone access for participants. If students call in to the session, they will be able to hear the session and participate orally in the session, but they will not be able to see what is on the screen or in the chat windows. The screen shot below provides a visual of the BBB default session layout. Each area of the BBB default session layout is labelled with a number that is explained in more detail below. The Audio, Video, and Recording control toolbar is at the top left-hand side of the BBB default layout screen. See the screen shot below for a close up image of the toolbar. This image is a screen shot with a close up image of the Audio and Video tool bar in BBB. Audio button: Use this button to mute and unmute your headphone’s microphone during the BBB session. This button turns audio input on and off. Video button: Use this button to control the BBB video recording. This button turns video on and off. Desktop Sharing button: Use this button to broadcast your desktop for all users to see. NOTE: Sharing your desktop requires the user to have the latest version of Java. For more information, watch video on how to share your screen during a presentation. Recording button: Use this button to record your BBB session. Microphone button: Use this button to turn any external microphone on and off during the BBB recording. NOTE: You must set up the recording link in your class before turning on the recording. Instructions are above in the section called “Adding a Recording Link to a Session”. 2. The Participation toolbar is at the bottom of the users window. See the screen shot close up below for a visual of the two buttons found in Participation toolbar. The Hand button allows users to raise their hands, vote, and express emotions via emojis. The Gear button can be used to clear a user’s status, to mute an individual or all participants, to lock viewers or to create breakout rooms. For more information about how to create and manage breakout sessions, watch this video tutorial. 3. The Presentation toolbar is at the bottom of the Presentation window. See the screen shot close up for a visual of the two buttons found in the Presentation toolbar. The Add Page button allows you to upload a document to the BBB session. Document formats can include Word, PowerPoint, and PDF. Click the Upload Presentation button at the bottom of the screen. Browse to find your presentation and click upload. Your presentation will load and present itself in this window. Once you’ve loaded your presentation, the box changes and provides more options. The title “presentation” changes to the title of your uploaded file.NOTE: Everything within the presentation box will be visible to students at once.The red dot is actually your mouse. Students will be able to follow your mouse by following the red dot. This enables you to direct their attention (e.g. point out key images). You may also use the zoom feature to narrow in on a particular image. 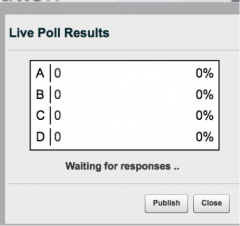 The Graph button allows you to conduct polls to increase student engagement. Click the Graph button located at the bottom of the Presentation pod window. Select the type of poll you would like to use. 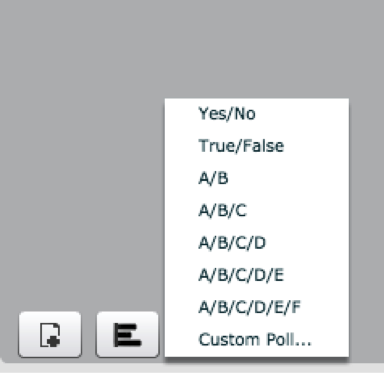 You can use preset poll types, such as true/false or 4 answer multiple choice polls, or you can create a custom poll. See the screen shot for a visual of the poll type selection menu that appears when you click the graph button. Prompt participants to answer the poll. When all or most participants have answered the poll, click Publish results and the poll totals will display in the session. See the screen shot for a visual of the Live Poll Results window with the Publish button. Annotation tools allow the moderator to highlight and annotate the presentation in the window. The annotation toolbar is visible in the Presenter view when the user puts their cursor over the presentation window. NOTE: Only the session moderator is able to annotate the presentation. You can allow participants to annotate the presentation by changing their role in the session. See the screen shot below for a close up of the annotation tools with an explanation of each tool’s function. Annotation tools and their functions are explained in the list below. The hand button allows the moderator to pan and zoom in the presentation. The pencil button, square icon button, circle icon button, triangle icon button, diagonal line icon button, and T icon button allow the moderator to mark and annotate the presentation. The circle with an x button it clears all the annotations added to the presentation. The backward arrow button is an undo button that removes the most recent annotation. The rectangular box icon allows the moderator to select a text and annotation colour. The smaller rectangular box icon allows the moderator to select different line widths for the annotations. The presentation progress buttons at the bottom of the Presentation window allow the moderator to move through the presentation. The forward arrow advances the slides. The backward arrow moves the slides backward. The Shortcut Keys button is located on the top right hand corner of the BBB window. See the screen shot below for a visual of he Shortcut Keys button. When you click on the Shortcut Keys button, a table of shortcuts and their functions appears. 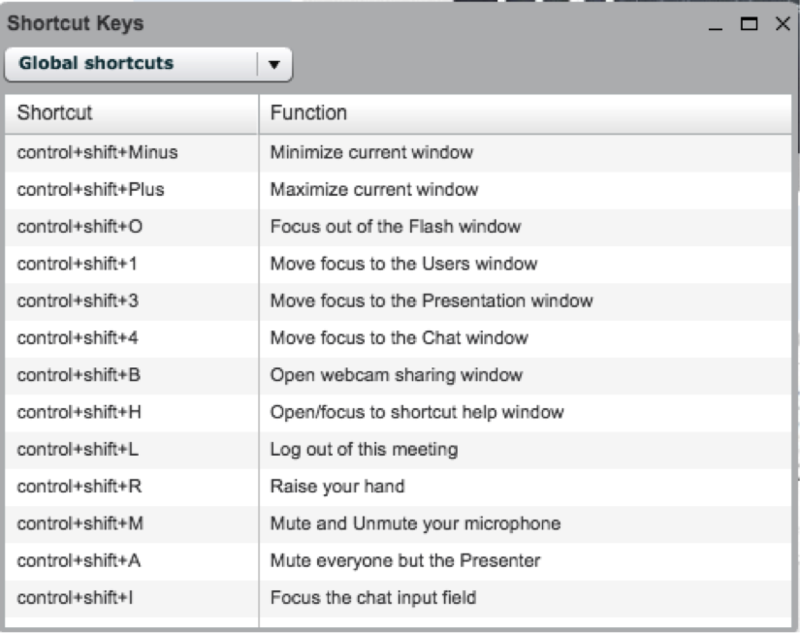 These Shortcut Keys are tools that will help you manage your presentation more smoothly. 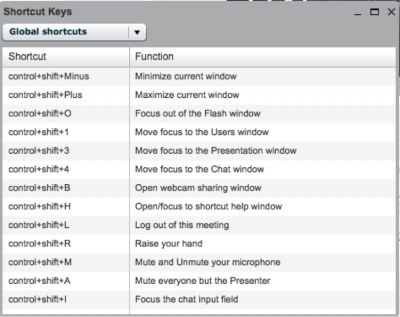 See the screen shot below for a visual of the Shortcut Keys table and their functions. You can resize BigBlueButtonw windows by clicking and dragging the edges. You can move pods by dragging and dropping them. Users: This window displays all BBB participants. The status column indicates all users’ roles in the classroom. The instructor can change the presenter role by clicking the icon on the bottom and highlighting the user’s name. Webcams: This window displays video input from user webcams. Multiple users can share their webcam at the same time. There is no built-in limit on the number of simultaneously active webcams. Presentation and Whiteboard: This window displays presentations with a whiteboard feature. The whiteboard controls let you annotate key parts of your presentation. Click on the Options tab (beside the Public tab at the top of the Chat window). A window will appear with a list of participant names.